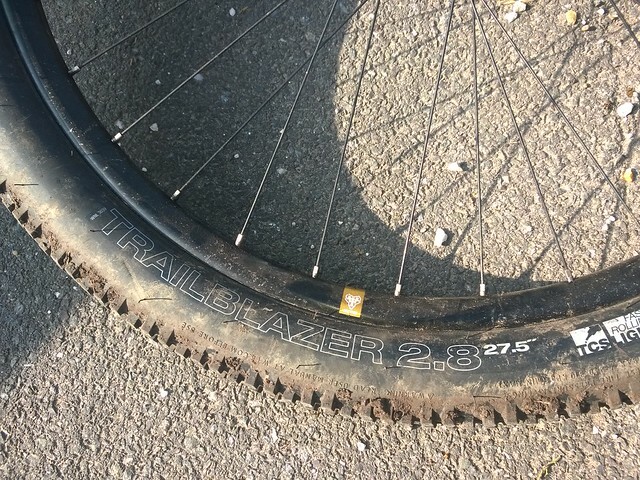 We have been doing a little more riding on the 27.5+ WTB Trailblazer tyres over the last few weeks and thought I'd share what we are finding. Firstly, the pressures I quoted in my first update of 15psi front, 20psi rear were way off. That's what I sent them at the day before the ride, but as you'll recall (check out the news story if you haven't seen that letter: http://www.cotic.co.uk/news/2015/chubby) I found the tyres pretty soft, but just about usable on that first couple of rides. As it turns out, the day between pumping up and riding was key given that I'm running them tubeless. Subsequent resetting of pressures to 15/20 and riding immediately resulted in a very firm ride, and not dissimilar to normal tyres. It lost that monster truck feeling of smothering the bumps, although the front end handling was sharper. In reality the pressures I was running those first couple of rides was closer to 9 front/12 rear (all these are indicated pressures on the same pump BTW, not with a calibrated gauge) which with more experience I have found is right on the very lowest limit for me to ride weighing 85kg. My preferred set up has moved towards around 13 front/16 rear. It rolls well enough yet still smothers the bumps. I'm always skirting on that limit of where it's too soft at the front so the tyre collapses and spreads out when I loaded the front end, and getting a postive front end but still some float. "Cy's been riding and enjoying the chubby wheels for a while and I wanted to try them too so we set up a back to back comparison test. 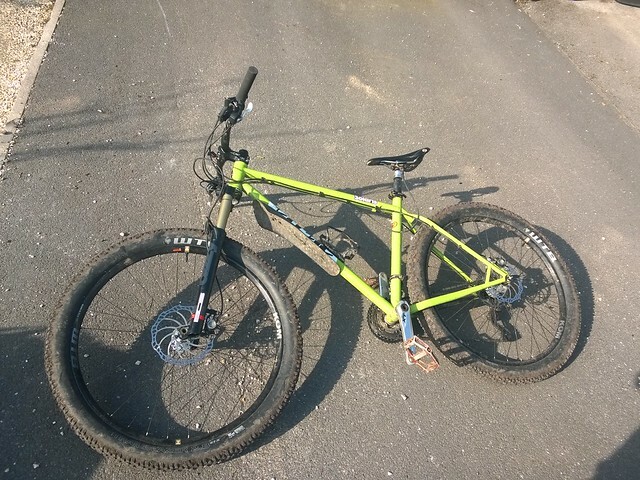 Both of us on Solaris bikes, one with standard 29er wheels and 2.2" Maxxis tyres and the other with the 27.5"+ wheels and WTB TrailBlazer 2.8" tyres. I rode the standard wheels first and followed Cy along some swoopy singletrack. I was happy with the control wheels and I was riding as I expected, but in longer corners or S bends Cy could just pull away a couple of bike lengths. Must try harder to keep up I thought, but each time it was still the same little gap appearing as before. Time to swap wheels! With the 2.8" tyres I instantly felt more cushioned or isolated from the trail vibration as you'd expect from running with just 12psi front, 14psi rear. They obviously require a bit more effort to get them moving, but once rolling I didn't feel any extra resistance or drag over the standard wheels. On the twisty bits it was my turn to lead and I pulled out the same 2 or 3 bike length gap over Cy riding the standard wheels that he was able to do before. There's more grip available, but there's also good feedback on the grip level which allows you to lean over more and hold more corner speed. In a series of linked corners it's possible to open a gap over a bike with standard wheels, then on rougher straight sections the greater cushioning allows you to hold more speed too. As for downsides, well I haven't ridden them on long climbs yet so the extra weight might be more apparent over a long ride, but they'd certainly be fun on the other side. Also, we're using quite narrow rims for this size of tyre and occasionally it was possible to squidge the tyre over on an off camber lip or root - perhaps a bit more pressure would solve this. Overall I was impressed at how well they rolled and how much fun they were to ride." My thoughts on the day agree completely with Paul. It was fascinating to feel comparatively rattled around and a little bit hampered by the bumps on what would usually be considered smooth riding 29" wheels. I also did ran some different pressures, going as low as 8 front/11 rear which was much too soft, although not completely unrideable. I came back to my more usual 13/16 setup at the end and that felt good. Following on from this we have decided to get a set of the wide Scraper i45 rims to see what a difference they make to the performance. It will certainly be interesting to see if more support on the front tyre helps. The major downside of these rims is that they're 260grms heavier than the KOM i25's per rim, so it's a big chunk of weight to add to the bike. We will see what this trade off brings. The key thing we're working towards is finding our preferred setup so we can spec a 27.5+ option on the Solaris complete bike later in the summer. If you'd like to feel for yourself what these tyres are like, we have decided to offer the option of running them on a Solaris on the demo days. We currently only have one set of wheels/tyres so it will be one bike per ride, so there will be four opportunities to give them a go during each demo. If you already have a Solaris booked you can give them a go, or maybe add another ride in with these to compare to regular 29er wheels? The demos are on 18th April, 16th May and 6th June at our place in Calver, Derbyshire. Email demo@cotic.co.uk to book on.